It’s not often we get a chance to rave about overseas furniture designs, safe in the knowledge that the designer ships to Australia. Feel free to go crazy at US-based PetitNest. PetitNest have a small but beautiful range of nursery furniture focused on cots, matching dressers, gliders and cot linen. The designers behind PetitNest may look familiar – in fact, they are actress Tiffani Thiessen (who has starred in lots of things over the years but I remember her best as the scheming Valerie Malone in Beverley Hills 90210, circa 1994) and Lonni Paul, finalist in US television series Design Star. PetitNest came about when Paul and Thiessen struggled to find the pieces they wanted for Thiessen’s daughter’s nursery. Wanting to avoid nursery interiors that were railroaded by traditional blues and pinks, Thiessen and Paul created pieces to carry similar styles and colour palettes from a modern home through to the nursery – walnut and beech trims contrast with stark white and splashes of plum, apple green and pale blue are introduced through the soft furnishings. The Alouette Crib in walnut is certainly a show stopper. 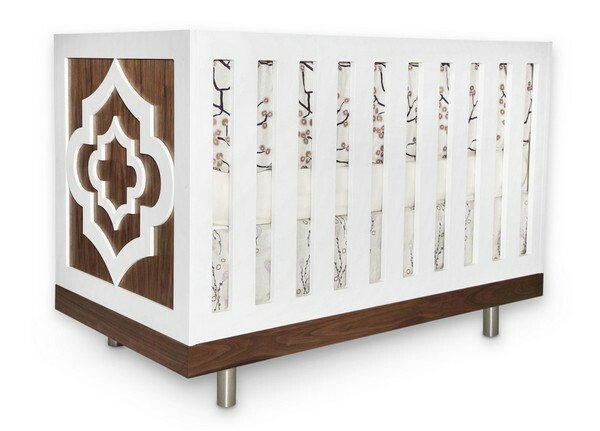 Cots are US$1490, dressers are US$1650, gliders range from US$1290-$1390 and cot linen sets are US$590. PetitNest ships to Australia. The PetitNest collection is similar in concept to the New Traditionalists collection that we reviewed here and here but instead uses thoroughly modern shapes and colours. Check out other cots using the Babyology Chooser.